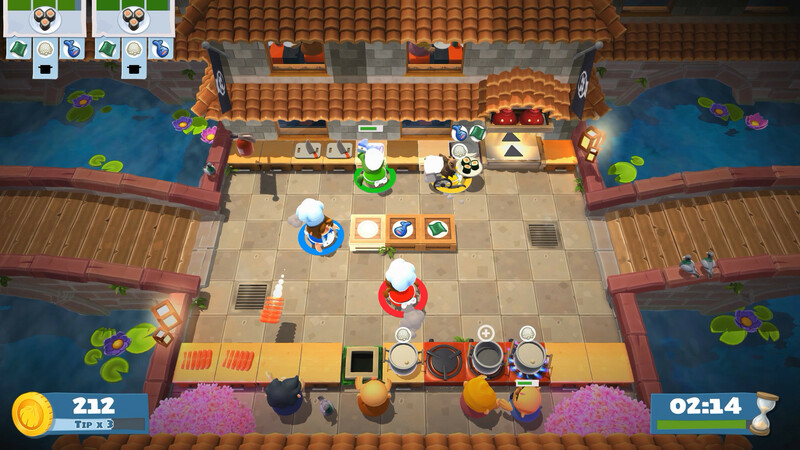 In Overcooked 2 you again have to save the world, satisfying the hunger of dangerous monsters. This time, you need to satisfy the hunger of the Walking Bread. Prepare different dishes skillfully and quickly switching between chefs. Your brain will boil, training your multitasking. Travel the world and cook in a variety of cuisines a variety of dishes. Is a social arcade game based on the well-coordinated work of the players. Each of the users will become a top-class chef and will try, in cooperation with another player, to create the most incredible and exquisite dishes. You have to go through a lot of trials and create dishes in the most difficult conditions. For example, you have to cook soup in the crater of a volcano, or try to fry fish in space. 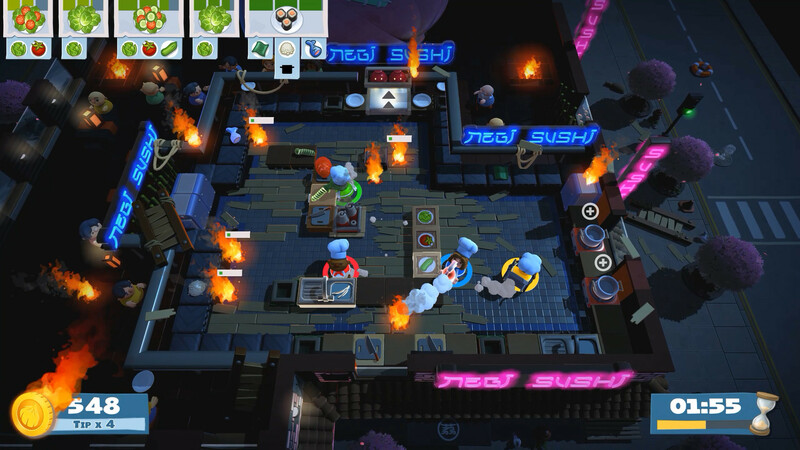 Each kitchen arena has its own unique features and obstacles that must be overcome and try not to get lost while cooking a dish. Are you ready for this challenge? Do you have the courage to get to the very end? And can you negotiate with your partners in the party? Soon we will find out. This game has been updated 18-04-2019, 08:24 to the latest version v20190418 (Campfire Cook Off). •New map – babbling brooks, rustling trees and glowing fireflies surround you in this stunning new map! •New camping themed kitchens – 12 regular and 3 Kevin kitchens! 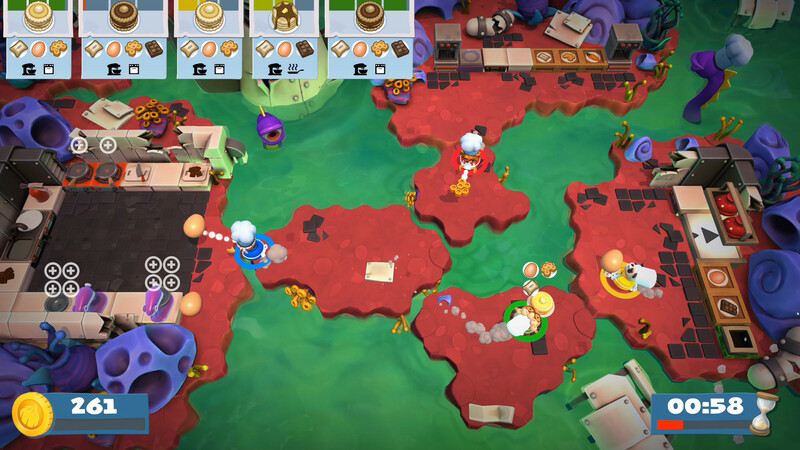 •New chefs – owl chef, beaver chef, explorer chef and bear chef! •New recipes – s’mores, cooked breakfast, blueberry pancakes and olive pizza! •New mechanic – backpacks! These give a whole new meaning to “food on the go”! Worn by you or a fellow chef, these backpacks contain ingredients needed to serve up tasty meals! •New mechanic – campfires! In the Campfire Cook Off kitchens there really is no food without fires! Chop wood and keep the campfires stoked to ensure your delicious meals are cooked properly!